Between 2004-2014, the commodity price boom allowed the Venezuelan regime, led by Hugo Chavez, to control and discretionally allocate funds to cronies, buying their consciences. It is only now, when the socialism of the 21st century model has succeeded in bankrupting the country – when the default of the debt is a fact, when PDVSA (the state company that during the last century was considered among the top of oil companies) has been largely destroyed and is producing a third of its capacity, when massive migration through the borders is pressurising neighbouring countries – that the world has finally recognised the tragedy in Venezuela. The Venezuelan economic crisis is worse than that of 1930s, or the one produced by the Spanish civil war, and even the one recently experienced in Greece. By weakening property rights, ignoring the rule of law, imposing suffocating controls and confiscating productive lands and industries, the economic model dismantled the economy and scarcity reigns on the shelves. At the start of the 21st century, Venezuela held an external debt of about $35 billion (about R502 billion), now it amounts to $185 billion, more than seven times the country’s exports, and its conditions are impossible to meet. The country is experiencing an accelerated hyperinflation that is getting close to that experienced in Zimbabwe. The minimum monthly salary does not buy a pound of cheese. Add to this the deterioration in basic service infrastructure (water, electricity, transport, telecommunications), in education and health services, the life in Venezuela is incomplete chaos. If the economic situation is disastrous, it’s difficult to express how bad the social burden is: the latest survey on life conditions, advanced by the most prestigious universities of the country, indicates that 87% of the population is poor (by income level). The structural poverty surpasses 35% of the population, and more than 300 000 people are close to death if they do not receive urgent assistance. In May 2018, an illegal and fraudulent call for election took place, so its results (the re-election of Nicolas Maduro) were not recognised domestically or internationally. On January 10, Maduro’s legal presidential period expired, which left a vacuum of power. According to Art. 233 of the Venezuelan constitution, it is mandatory for the president of the national assembly to assume the position of president of the republic until new country-wide elections are held and that is why Juan Guaidó, president of the national assembly, is now serving as the interim president of Venezuela. More than 50 democratic countries, initially from the western hemisphere and then from the rest of the world, as well as important multilateral organisations and world renowned personalities, have recognised Guaidó as the legitimate president of Venezuela; giving him their support to lead the transition process to democracy and to meet the complex humanitarian tragedy afflicting the Venezuelan society. Meanwhile, Maduro is still holding on to power and usurping the presidency, supported by countries like Cuba, Russia, Iran, North Korea, Nicaragua, South Africa and Bolivia and military and paramilitary corps. Given the complex humanitarian crisis in the country and based on Resolution A/RES/60/1 of the United Nations of September 16 2005, a humanitarian aid effort was organised worldwide for Venezuela. The first delivery of food and medicines had reached Colombia en route to Venezuela, but on February 23, military and paramilitary men ordered by Maduro impeded their entrance: blocking the roads, repressing and eventually burning the trucks with the humanitarian aid content in Venezuelan territory. Simultaneously, some aid actually got through the border with Brazil, but the Venezuelan military attacked the indigenous Pemones who were bringing in the supplies. Four dead and many injured was the balance of that day. Guaidó was in Colombia to observe the attempt to deliver the aid, in the company of the presidents of Colombia, Paraguay and Chile. After attending the meeting of the Group of Lima and visiting some Latin American countries (Colombia, Brazil, Paraguay, Argentina and Peru), he returned to Venezuela by air through the International Airport of Caracas, where with the threat of arrest hanging in the air, he was received by a group of diplomats representing 12 countries: Argentina, Brazil, Canada, Chile, Peru, USA, France, Germany, Netherlands, Portugal, Rumania and Spain. He addressed a large crowd of people in Caracas and, the next day, met with unions from the public sector and businessmen. 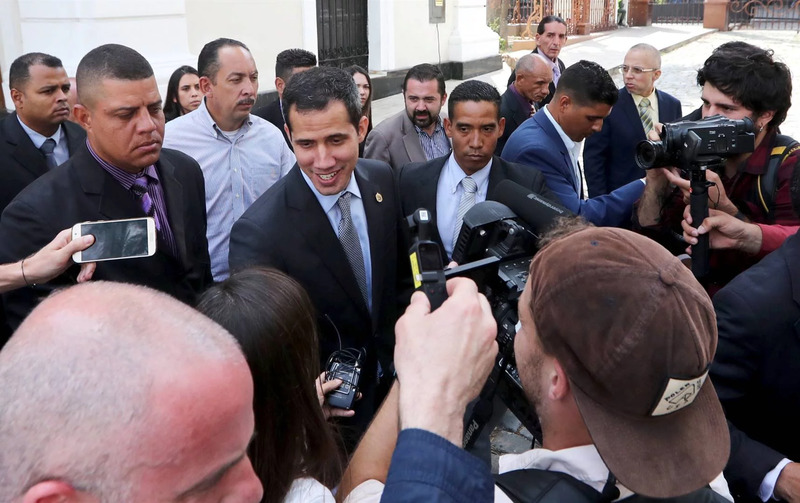 Despite Maduro usurping the presidency, the legitimacy of Guaidó is increasing domestically and internationally. Maduro’s support is guns. Guaidó’s support is people. The Venezuelan civil society has spoken loudly and clearly many times during the last 20 years: during the massive demonstrations in 2002, 2007, 2014, 2017, and during these first two months of 2019. Always peacefully, calling for freedom, democracy, transparency, fairness and inclusion. The only way to begin the reconstruction of the country is with a political change, recognising the rule of law, allowing freedom of expression, promoting the production of goods and services; and respecting human rights. That is what will bring back confidence in the country, and enable Venezuelans to rebuild the country again from scratch.